Just a reminder, the TPT Sale was extended - my items are on sale through tomorrow and today is the last day for an extra 20% off. I also have my Teachers Notebook Shop on sale! I wanted to pause for a minute and give a shout out to my bloggy buddy Sarah! She has a great blog called Teaching Resources for the Classroom and she has so many great ideas! Sarah always has freebies for you, ideas on her blog posts, and she has a terrific TPT store, too! Her ideas, especially on her blog posts, are very creative, artistic, and she is a pro at making great connections with science curriculum. One of my favorite recent blog posts of hers was titled "5 Tips for Bringing Environmental Education in the Classroom". Check it out here or click the image below. One of her tips is collections - kids love collections, right? My students have been super into collecting Pokemon cards, but we all know some lil' rock collectors, insect collectors, budding botanists, and more? Why not tap into that to enrich your curriculum. She also has a suggestion to look for signs of animals and plants around your campus. Bird watching and feeding is a great way to do this. Now, where I live in New England, winter only ended about 4 weeks ago, but you can feed birds all year no matter where you are! Great idea! Sarah also has a lot of great math and language arts products at her Teachers Pay Teachers store.. 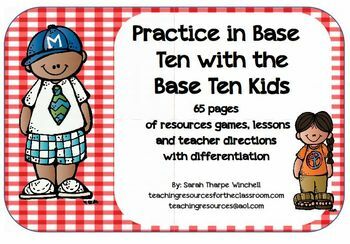 Here's one of my favorites: Practice in Base Ten with the Base Ten Kids Numbers and Operations in Base Ten. It is 65 pages long and aligns with the CCSS for numbers and operation in base ten. It includes an I Have Who Has Game, math task cards, and matching games for place value and math thinking sheets! Check it out over at TPT! I'm lucky to know Sarah and I hope you drop by one of her sites and say hi! It's Almost Monday Again - How about a Freebie? Five for Friday - Allergy Season! We LOVE to Move it Move it with GoNoodle! Oops! Finally getting to Currently!